Women in Science: Should Doctor Who Be a Woman? Should Doctor Who Be a Woman? If you follow SF entertainment news, you've probably read a lot of speculation as to who will take over for David Tennant as the regenerating Time Lord Doctor Who. The UK Resource Centre for Women in Science, Engineering and Technology (UKRC) has launched a campaign to to encourage the selection of a woman for the role. "There is a distinct lack of role models of female scientists in the media and recent research shows that this contributes to the under-representation of women in the field. "The UKRC believes that making a high profile sci-fi character with a following like Doctor Who female would help to raise the profile of women in science and bring the issue of the important contribution women can and should make to science in the public domain." 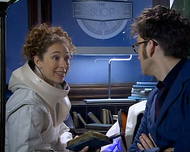 I think it would be fun to have a woman Doctor - maybe played by Alex Kingston, who appeared as archaeologist Dr. River Song in two episodes of Doctor Who earlier this year. I'm not sure it would necessarily do much for the perception of women in science though, since the Doctor isn't exactly a scientist - more like an adventurer who knows lots of science (he has picked up a wide range of knowledge over the centuries), but actually can fix most problems by zapping with his trusty sonic screwdriver. If you agree that the next Doctor should be a woman, you can join the UKRC Facebook group "Make the next Dr. Who a Woman!" I did! It would be very cool to see Romana again!